This is my favorite way to cook salmon on the grill. Using the cedar plank really makes the difference by allowing the salmon to soak up the smokey flavors and also providing a platform to keep the salmon from falling apart. Just be sure to use a clean untreated cedar plank. Since fresh salmon is a little pricey here I used some frozen salmon fillets that I picked up from a wholesale club and they still came out great. Although I bet fresh would have been even better. Go ahead and mix up the marinade of soy sauce, garlic, green onions, ginger, vegetable oil and rice vinegar in a bowl and then pour over the salmon fillets. Then cover and let this marinade in the fridge. I let this marinade for about four hours. Use a clean untreated cedar plank and cover it with water and let is soak for at least one hour. You'll need to put something on top of it to weigh it down so it's completely submerged. Heat up the grill and and cook these over indirect heat for about about 20 minutes until salmon flakes easily with a fork. I grilled these along with some corn on the cob. This is so easy peasy to make and tastes amazing! Soak the cedar planks for at least 1 hour in warm water. Soak longer if you have time. In a shallow dish, stir together the vegetable oil, rice vinegar, sesame oil, soy sauce, green onions, ginger, and garlic. Place the salmon fillets in the marinade and turn to coat. Cover and marinate for at least 15 minutes, or up to one hour. Preheat an outdoor grill for medium heat. Place the planks on the grate. The boards are ready when they start to smoke and crackle just a little. 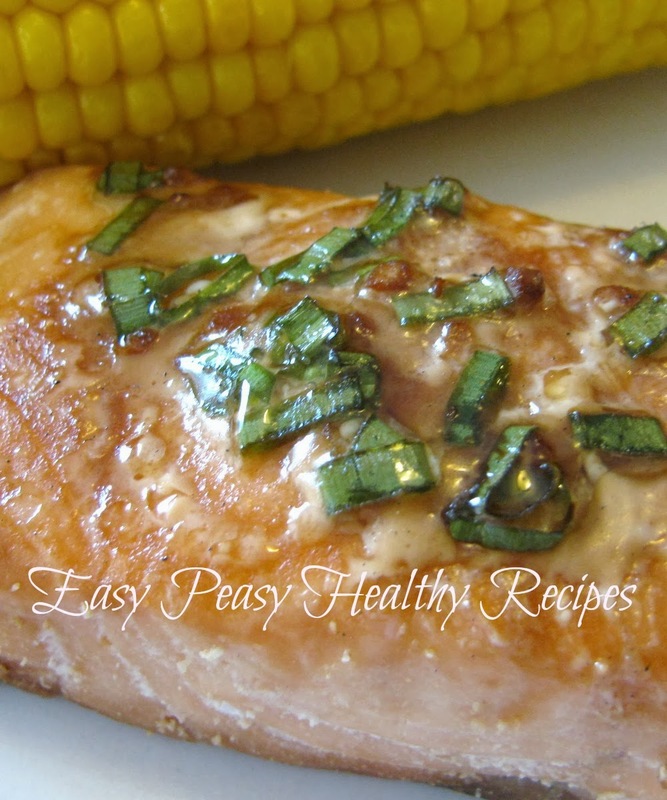 Place the salmon fillets onto the planks and discard the marinade. Cover, and grill for about 20 minutes. Fish is done when you can flake it with a fork. It will continue to cook after you remove it from the grill.